Taiko Drums To Start Summer With A Bang -- SO SAY WE ALL!!! (May 27, 2009- Burbank, CA) – Battlestar Galactica and Caprica composer Bear McCreary will have a busy summer, with the release of two soundtrack recordings and concert performances. On June 13 the music from Battlestar Galactica will kick-off the 2009 Grand Performances Series at California Plaza. Three days later, on June 16, La-La Land Records will release the soundtrack for Caprica. Bear McCreary will again conduct the music from Battlestar Galactica for three nights at the House of Blues in San Diego from July 23-25th – during Comic Con! The concerts will celebrate the July 21 release of a special 2-CD set, Battlestar Galactica: Season 4. Battlestar Galactica began as an original SCI FI Channel mini-series in 2003. Billions of human lives were consumed by nuclear fires as the Cylons, intelligent robots created by man, rebelled against their makers. A small, rag-tag fleet of survivors escaped and fled into the outer reaches of the universe in search of the mythical, lost "13th colony" — Earth. The SCI FI series celebrated its finale in March of 2009, having received boundless critical acclaim and awards, including the prestigious Peabody Award as well as special recognition from the United Nations. 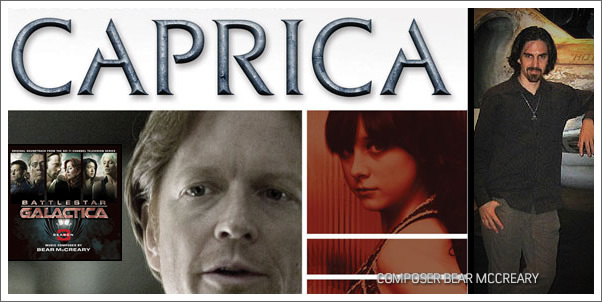 A few weeks later, the prequel Caprica, set 50 years before the events of Battlestar Galactica, was released on DVD by Universal Home Entertainment. Caprica will begin airing in early 2010 on the SCI FI Channel. The series chronicles an astonishing scientific breakthrough taking shape on the planet Caprica. The rapidly evolving spheres of human and mechanical engineering have collided, along with the fates of two families. Joined by tragedy in an explosive instant of terror, two rival clans led by powerful patriarchs, Joseph Adama (Esai Morales) and Daniel Graystone (Eric Stoltz) duel in an era of questionable ethics, corporate machinations and unbridled personal ambition as the final war for humanity looms. On June 16, 2009 La-La Land Records will release the soundtrack for Caprica, composed by Bear McCreary, one of the top young composers working in Hollywood. His work on the television series Battlestar Galactica has been described as offering “some of the most innovative music on TV today,” by Variety, and his blog www.bearmccreary.com/blog, which features in-depth inside looks at the process of scoring Battlestar Galactica, was called "one of the best blogs in the business. It's a fascinating look at the process of making music for film and television and the care he takes with aligning the score with the twists and turns of each character's plot lines," by The Hollywood Reporter. Bear McCreary’s feature film credits include Wrong Turn 2 and the Rest Stop films. He also scores the series Eureka and Terminator: The Sarah Connor Chronicles and will be scoring the upcoming SCI FI series Caprica and the Capcom video game Dark Void. McCreary was among a handful of select protégés of late film music legend Elmer Bernstein and is a classically trained composer with degrees in Composition and Recording Arts from the prestigious USC Thornton School of Music. In 2005 La-La Land Records released the soundtrack for Battlestar Galatica: Season One, which quickly became the top selling release by the label. One year later, the second season was released and was celebrated with Bear McCreary’s first sold-out concert performance in Los Angeles. In 2008 the concerts moved to a larger venue selling out two nights at the famed Roxy on the Sunset Strip. The two-CD Season Four soundtrack will be released on July 21st. The first disc features music from seasons 4.0 and 4.5, with the music from “Daybreak”, the stunning series finale, featured on the second disc. The Caprica original soundtrack will be available in stores or from www.lalalandrecords.com on June 16, 2009. Battlestar Galactica: Season 4 will be available on July 21st. kamagragenericviagra.com is designed to give you kamagra tablets online along with kamagra jelly, buy kamagra tablets, cheap kamagra tablets online, kamagra uk, buy kamagra, generic kamagra. Dr. Sanjay Mahendru is a fully qualified Cosmetic Surgeon india \ Cosmetic Surgery india \ PlasticSurgery \ Plastic Surgeon india \ Cheap Cosmetic Surgery india \ Scar Removal Surgery india \ Liposuction \ Tummy Tuck \ Breast Implants \ Breast Reduction india \ Eyelid Surgery \Microvascular Surgery \ Cleft Lip Surgery india \ Hand Surgeons \ Plastic Surgery For Children \ Cleft Lip Surgery india \ Hair Transplant in india. gogoa.com is designed to give you Goa hotel \ Book Hotels in Goa \ Cheap Hotels Goa \ Goa Hotels \ Resorts in Goa \ Goa beaches \ Villas in Goa \ Apartments in Goa \ Goa Hotels \ Luxury Hotels in goa \ Holiday packages goa \ Cheap Hotels in Goa \ Goa Resorts \ Goa tour packages at cheap and affordable price.